Denver’s future Hall of Fame quarterback Peyton Manning put up 5,477 passing yards this season (2013), and complimented them with a NFL record 55 touchdowns…These stats wouldn’t be stats at all if it wasn’t for one Bradbury Robinson, QB of St. Louis University Blue and White (the Bilikins nickname would come later). 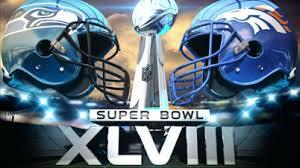 Robinson was the first, yes the first football player to throw a legal forward pass in an official game. 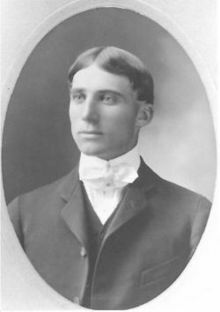 That game took place in Waukesha, Wisconsin at Carroll University on 9/5/1906 when Robinson completed his SECOND pass (his first fell incomplete which resulted in a turnover due to the rules at the time)…the next pass however found teammate Jack Schneider, who finished the 20 yard pass with a touchdown. St. Louis University went defeat the Pioneers 22-0 and, finished their season 11-0. The “Cliffs Notes” of how the pass came to be was that football was resulting in too many injuries, and was on it’s way to extiction. President Theadore Roosevelt looked for help to spread out the game to minimize the possibility of injury. He went to his friend, the Govenor of Wisconsin Bob LaFollette. 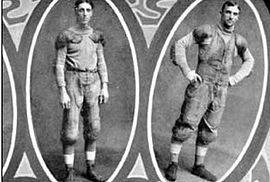 LaFollette summonded Robinson who was the QB for the Badgers in 1903 for a solution. Among Robinson’s ideas was incorporating some basketball and rugby tactics…(passing the ball). A few years later in the spring of ’06 the predicessor to the NCAA, the Intercollegiate Athletic Association of United States (IAAUS) offically legalized the forward pass…and the rest is history! So when Russell Wilson connects with Golden Tate, or Peyton hits Wes Welker with a pass during Super Bowl XLVIII, keep in mind that the first forward pass was completed here in Wisconsin, at Carroll University (chartered 1846). This entry was posted in Carroll University, college football, Football, NFL, sports, UW Badgers and tagged Bob LaFollette, Bradbury Robinson, Carroll University, Forward Pass, Jack Schneider, NCAA, NFL, Peyton Manning, St. Louis University, Theadore Roosevelt. Bookmark the permalink. You had to dig deep for that nugget. When teams play games with throwback jerseys why not have them also play with throwback pads!